I had not won in a long time, so I wanted the TPC very badly. Thirteen years into his illustrious career, here is how high the game’s greatest champion had raised the bar for himself: “Nicklaus Ends 6-Month Famine” screamed the Sept. 3, 1974 headline in the Des Moines Register. Clearly frustrated by not following up on a five-win season in 1971 and seven each in 1972 and 1973, Nicklaus made sure the debut of this PGA TOUR flagship event was dynamic and that he salvaged his season. Hampered by rain at Atlanta Country Club, the final round spilled into Labor Day Monday, but no matter, Nicklaus was at the top of his game. Nicklaus’ timing was perfect on several fronts. 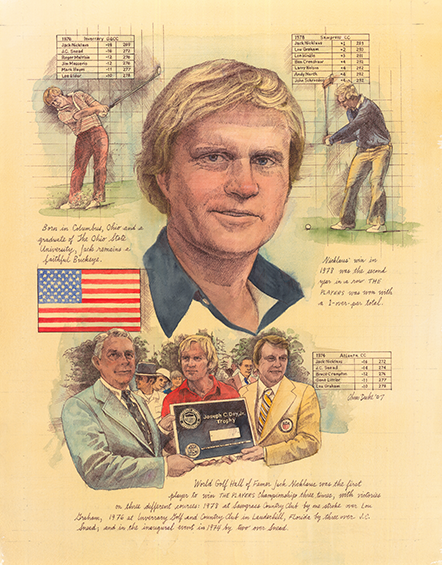 Just nine days later, he was part of the first class of World Golf Hall of Fame inductees and at 16-under 272 the victory seemed to springboard Nicklaus into a 1975 campaign that saw him pile up a TOUR-leading five wins. Most of all, though, THE PLAYERS was launched fittingly: The best player won the TOUR’s best tournament against the strongest field. Jack Nicklaus showed all his worth by taking on the course with strong iron play, overtaking three-day leader Snead by shooting an impressive 67 considering the conditions and claiming his first of what would be three titles. Born, raised and educated in Columbus, Jack Nicklaus became golf’s greatest star — but he never forgot his Ohio roots.